Coastguard: Man airlifted to hospital. A seriously injured man had to be airlifted from a hillside in the early hours of the morning after falling from a cliff edge following a "night on the town". The injured man was bleeding from the head and it is feared he could have suffered spinal injuries. 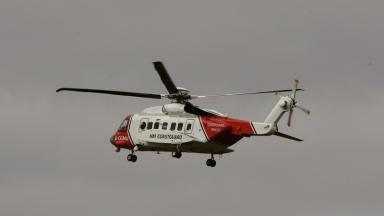 One man was airlifted by helicopter to Edinburgh Royal Infirmary, where he is being treated. "The information we have is they were out for a jaunt and one of them fell and got fairly seriously injured. Two BSRU members abseiled down to the casualties and secured the injured man. A rope access fire crew then assisted with the airlift operation. A Police Scotland spokesman said: "A multi-agency response was co-ordinated after a call was received at 1.45am on Saturday. "Three males were stranded on North Berwick Law. "The males were successfully recovered from the hillside and one of the males was taken to Edinburgh Royal Infirmary where he is being treated."